How can you download and install the google malayalam type software on your computer. this is the very easiest method to type malayalam language from your computer. google malayalam type is very easy to use and download. it can be used on both online and offline. with the help of google malayalam type software you can type malayalam very easily. 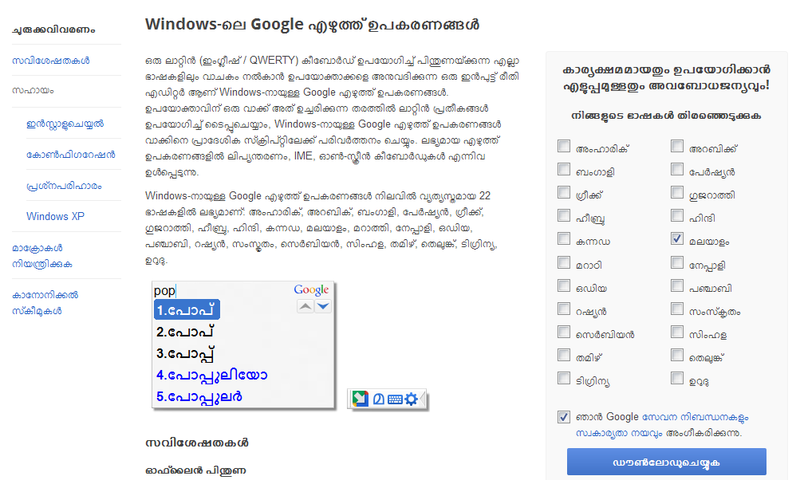 Step by step instruction of installation of google malayalam typing software on your personal computer. visit the link http://www.google.com/intl/ml/inputtools/windows/ and you can see the webpage with all details. you can read the features and instructions to install malayalam type in computer. from the page select the language and accept the terms and conditions. check the below image for the details, it will help you to download type malayalam software. click on the download button, it will download the software. once it downloaded open and install google malayalam type software on your computer. once its completed you can see the ml/en option in the language bar. check the below fro the same, you can toggle between english and malayalam. if you selected malayalam system convert your type to malayalam. with the help of google malayalam type tool you can write in malayalam in facebook and etc. If you are using android smartphone can check google indic or hand write tool. These simple tools and application will help you to write content in malayalam. you can avoid typing manglish comments in facebook and other social media. jut install and use these free software for typing malayalam and other indian languages. yes i am using the google malayalam type in my system its very easy to use. i am using this tool in my windows computer. its very easy to write in malayaalam using this tool.